Northam's resignation obviously won't come about from people saying "please resign." 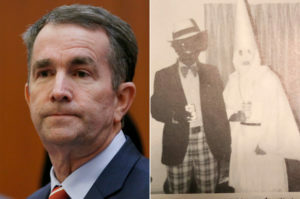 And now, his inept responses confirming/denying the photo, confirming his use of shoe polish for a dance contest, and saying he talked with a "black aide" during his 2017 campaign and wound up apologizing to him (and doing nothing more), throw not only his questionable past into the mix, but his current sense of entitlement, too. Apparently, he is unresponsive to a clear consensus — which makes little sense, but we have some precedent among Colorado politicians. Escalation points — both formal (resolutions of censure) and informal (no one calling him or answering his phone calls? no invitations to do anything?) — may be needed. It may take awhile (so the refresh process may not be helpful). But those with public statements urging resignation seem unlikely to forget or forgive. The only questions appear to be what additional pressure points will be used and what sort of exit ramp or ejection seat will be used. 15 year old charges of sexual assault have surfaced against Fairfax! If they both quit, attorney general mark herring, a democrat, moves up. Fourth in line would be speaker of the house, currently a republican. Also, northam could resign, fairfax become gov and appoint somebody to fill the empty lt gov. Job. Then if Fairfax resigned, the new lt gov. Would be gov.